Adopt A Cat Foundation, Inc. is a 501-C-3 non profit organization, committed to finding loving homes for rescued cats and kittens. 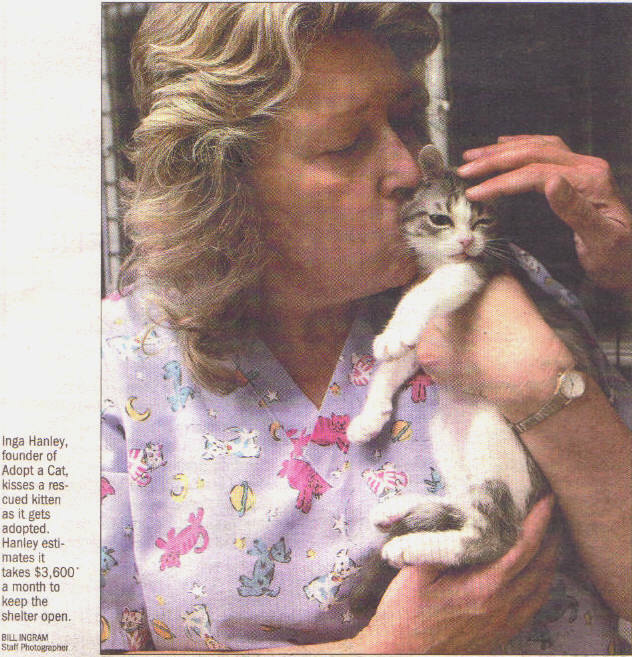 Founded by 20 year animal rescue veteran, Inga Hanley.The Foundation operates solely from donations and support from its volunteers. Adopt A Cat Foundation & their foster-care guardians provide shelter for over 200 homeless, abandoned, ill and injured cats/kittens everyday. Rescue, trap, spay, neuter and provide medical treatment. Evaluate and provide options for their continued care. Our cat shelter is a NO-KILL SHELTER. Return 'unadoptables' back to their colonies where a committed caretaker feeds them daily and monitors their ongoing condition. Mailings, flyers and our newsletter.